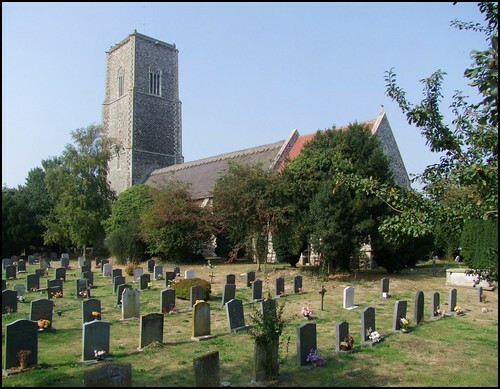 All along the East Anglian coast there are medieval churches with massive towers, and at Kessingland the church of St Edmund has one of the biggest. They serve as beacons and marking points to ships and sea, and this one has much in common with the one at Walberswick. Mortlock suggests the architect was the same person, Richard Russell, and that it was probably begun in the Spring of 1436 or 1437. It took about 12 years to complete, an extraordinarily short time for such a vast structure. The western face is glorious, with flushwork symbols, including Catholic imagery that the 16th and 17th century reformers must have thought outrageous. The way in which it rises above this busy coastal parish reminds me of those at Winterton and Happisburgh in Norfolk, and the fact that Kessingland is actually in the Diocese of Norwich is a mark of how far north we have come. Time has not been kind to either Kessingland village or church. The sea has come calling, as it has on so many villages around here, taking houses and lives. The people themselves destroyed the south aisle and chancel in the late 16th century, finding them expensive to maintain, and unnecessary for the Preaching House liturgy of the Church of England. The north side collapsed about a hundred years later, so really there is very little here from medieval times, apart from the tower. On an earlier entry for this church, I bemoaned the fact that St Edmund was kept locked without a keyholder, like so many of the Lowestoft area churches. How times have changed! This church is militantly open every day these days, with signs out on the road and a welcoming sign at the entrance. I warmed to it immediately, but I had not realised that I was about to step in a fascinating and compelling interior. You enter from the west, and down through an internal porch into the body of this big church. It must have been enormous when the aisles were in place. I was struck by how well-used it felt, how welcoming it was. The arcades have been filled in, leaving windows in the Decorated style on the south side, but an unusual series of late 17th Century domestic windows on the north side. The reason is explained by a wall inscription: This Church was put Out and Rebuilt by the care of John Campe and Thomas Godfrey Gent. in the Year 1694, and Finished in 95. Campe and Godfrey were the churchwardens responsible for overseeing the rebuilding of the church. A late 17th century nave is an unusual thing in East Anglia - an unusual thing anywhere - and coupled as it is with an Edwardian chancel I should think it is pretty well unique. Even if you had been transported here magically from the centre of London, you would know straight away that this was a coastal church. The paraphernalia of the main business of the parish is scattered around - anchors, ship wheels, pilot lights, and so on. Another big clue is the enormous list of names on the war memorials, most of them serving in the Navy. Up in the chancel, which was rebuilt at the start of the 20th Century, a plaque reminds us that it was erected to the Glory of God and in memory of parishioners lost at sea. The memory of the past is a deep one here, and the sum of it is still being added to: as recently as 2007, a fabulous new window by Nicola Kantorowicz was added on the south side in memory of the Kessingland driftmen. The glass in the east window is a good scheme by Kempe & Co at the height of their powers, depicting the Crucifixion flanked by the Blessed Virgin and St John, with the Suffolk Saints St Edmund and St Felix looking on. The other glass is not so good, a sentimental rendition of the three Marys at the empty tomb by the Maile workshop. The Marys in particular look decidedly awkward. But the great treasure of Kessingland church is not any of the windows, but the 15th Century font. Its great battered heavy bowl seems to melt like a ripe cheese, and the carvings depict seated figures, mostly women; among them you can see the Blessed Virgin and St Ursula. Around the stem is a sequence of Bishops and Saints. A curiosity on the north wall of the nave is that there are two separate memorials to Robert Provo Norris. He was killed in the first South African wars of the 1850s, and one of the memorials was erected as a mark of esteem by his brother officers. The other was set here, presumably, by his family, and notes that he died of a wound... received whilst gallantly leading his company into action against the Kaffirs, during the war then going on at the Cape of Good Hope. Peter, who was with me, spent some of his school days in South Africa, and noted quite how offensive the term 'Kaffir' would have been there, even by the late 19th Century. There is a jaunty ship wheel on the front of the pulpit which, along with all the other furnishings at the east end, is a nice piece of Edwardian sentimentality. And I really liked the fact that some of the older banners survive here - so often, they were thrown out during the course of the 20th Century. St Edmund still has two banners for the Girls Friendly Society. This was a movement begun in 1875 by Mrs Mary Townsend, and it was designed to befriend and support unmarried girls coming out of the countryside to work in service in the towns. One of the banners here has TMF, short for Townsend Members Fellowship, across it: the TMF was what the girls moved on to when they grew up. The Girls Friendly Society still exists as an organisation working with young women in some Anglican parishes. Today it is known as GFS Platform. What a lovely thing that they have survived. Simon Jenkins once said that Anglican parish churches are the greatest folk museum in the world, and to see these banners still in place certainly feels like a touchstone to the past of Kessingland parish, like so much here. To enter this building is to enter the story of an English coastal parish.